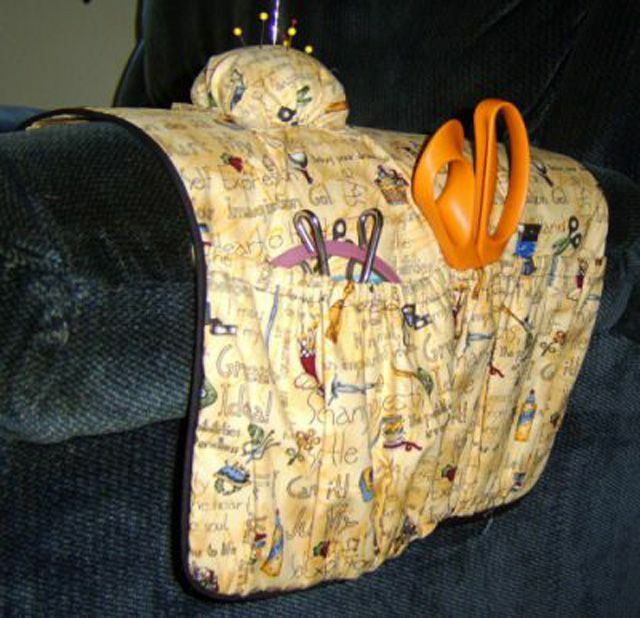 This arm chair sewing caddy will keep the things you need handy. The pincushion can be omitted and the pocket can be adjusted to meet knitting, cross stitch or any crafting need. Mark in one inch from each corner on all sides of both 6" squares. Sew gathering stitches between the markings. Place the right sides together and pin the corners of the squares. Gather each side so the square is 4". Sew the sides of the square, leaving an opening to turn. Trim the corners to eliminate bulk. On the body piece, mark 11" from the bottom and 3 " in from the edge. Center the ​pincushion on the 11" mark, 3" in from the edge. Top Stitch the pincushion in place. Fold the 15" sides of the pocket creating a 7" X 22" piece. Press the fold. The fold will be to the top of the pocket. Stitch 1/2" from the fold along the folded edge. Fold the 22" length in thirds and mark the top and bottom of the folds. Insert the elastic in the casing the stitching formed, anchoring the elastic at both edges. Gather the bottom edge of the pocket so that it is 14" wide, distributing the gathering evenly. Note: The pocket divisions are adjustable to suit your needs. One large pocket could be left for things like yarn and knitting. Two pockets could be made for something like cross stitch so there would be a pocket for the hoop and a pocket for supplies. Align the gathered edge with the bottom of the main body piece. Align the sides of the pocket with the sides of the main body piece. Baste the raw edges together, using a 3/8" seam allowance. Distribute the elastic gathers evenly so that the third markings are even with the bottom third markings. Top stitch through the pocket and backing, connecting the markings and creating the pockets. Place right sides of the body pieces together and trim the corners to gently round them. Optional: Sew piping to the raw edges of the body piece that you have attached the pocket to. Placing right sides together, align the edges of the main body piece. Sew the edges, using a 1/2" seam allowance, leaving a 3-4" opening to turn the piece right side out. Press so the seam is at the edges.